Max Sieben Baucus (born December 11, 1941) is an American politician. He was the United States Ambassador to China from 2014 through 2017. He served as a United States Senator from Montana from December 15, 1978 until February 6, 2014. On that date, he was made Ambassador. He is a member of the Democratic Party. He was Montana's longest-serving U.S. senator. Baucus was born on December 11, 1941 in Helena, Montana. He studied at Stanford University. Baucus was married to Ann Geracimos from 1982 until they divorced in the same year. Then he was married to Wanda Minge from 1984 until they divorced in 2009. He has been married to Melodee Hanes since 2011. He has one son, Zeno, with Geracimos. Baucus announced on April 23, 2013 that he would retire from the U.S. Senate at the end of his term. His term was set to end in 2015. However, he was made United States Ambassador to China by Barack Obama in 2013. He resigned on February 6, 2014, before finishing his final term as senator. Baucus was succeeded by John Walsh, the former Lieutenant Governor of Montana. 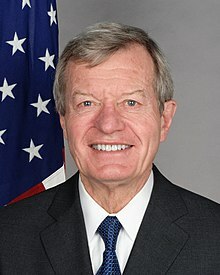 Wikimedia Commons has media related to Max Baucus.